You have two application windows open in Windows 10. In one window you are doing data entry. In another window you have multiple pages of information you are referencing, requiring frequent scrolling. You can only have one active window at a time, but you would like to keep the “data entry” window active while still being able to scroll in the inactive “reference” window. 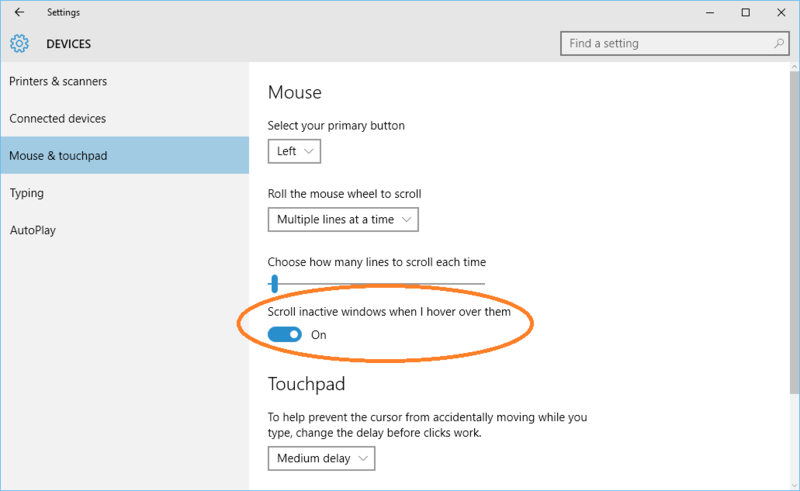 The best way to accomplish this in Windows 10 is to make sure “Scroll inactive windows when I hover over them” is enabled in Mouse & touchpad. You can get there by clicking Start | Settings | Devices | Mouse & touchpad –or– by typing “mouse” in the Windows 10 Search box and clicking “Change your mouse settings”. This will allow the “data entry” window to remain active while you leave the mouse cursor hovered over the inactive “reference” window. When you need to scroll the reference window, you can simply use the scroll wheel on your mouse. The “reference window will remain inactive, the “data entry” window will remain active.